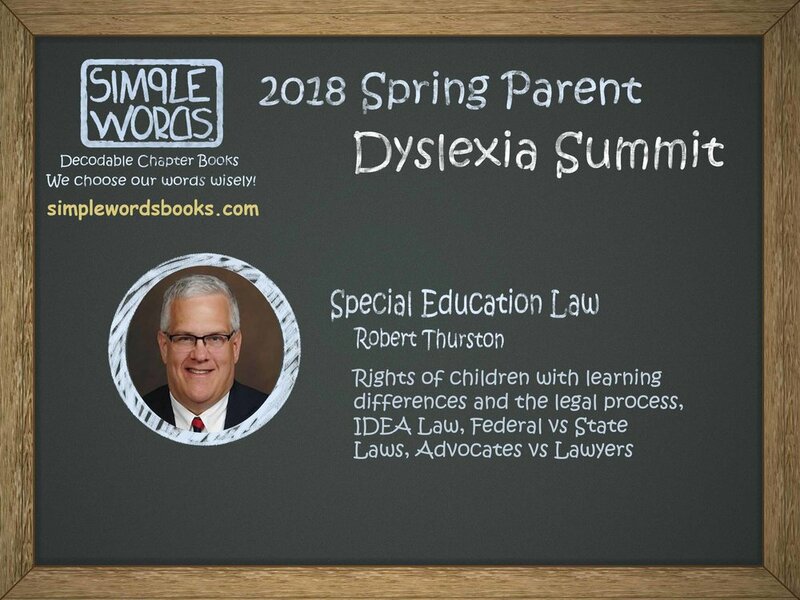 Welcome to our 2018 Spring Parents Dyslexia Summit! A FREE online event that you can access on your own timeline. Susan Barton is an avid advocate for dyslexia awareness. She supports children with dyslexia and their families. She is the founder of Bright Solutions for Dyslexia where they educate parents and teachers on what dyslexia is and how they can find the right type of support. In 2009, Susan was inducted into the International Dyslexia Association’s Hall of Honor for her work and dedication. We discuss common misconceptions about dyslexia, signs of dyslexia, strengths of dyslexics, Orton Gillingham (OG) based instructions, and more. Robert is a solo attorney and has been practicing law for over 30 years. His practice focuses on special education law. Rob has been an adjunct professor at McHenry County College and Harper CollegE ROb has two teenage sons, both with special needs, and a rescue dog named Maisey Blue. We discussed Rights of children with learning differences and the legal process, IDEA Law, Federal vs State Laws, Advocates vs Lawyers. John Hicks is a parenting and neuro-diversity coach. As a father of two neuro-diverse daughters, John knows how dyslexia and ADHD can affect a family. He supports parents and children from all around the world on topics of self-esteem, confidence and self-advocacy, as well as helping these children recognize and reach their own full potential. We discuss the emotional side of dyslexia, wrong assumptions about dyslexic, common challenges for parents with children with dyslexia and advice for parenting raising dyslexic children. Gibby Booth is a Dyslexic Entrepreneur, Author, Speaker, Writing Teacher and avid dyslexic advocate. She is the creator and host of Dyslexia is my Super Power podcast. We discuss Gibby’s personal story: How she went from hating dyslexia to accepting it, then to loving it, calling it her superpower. Maria Toglia worked for years as an outpatient therapist with children, adolescents and families. For the past ten years, she has been a school psychologist working with students in early intervention through Grade 12. As a parent of a child with learning difference & ADHD, Maria not only has professional experience working on behalf of students and their families, but she also brings the perspective of a parent.